#23 w/Guerra a Muerte - Latin America's "War to the Death"
Americans seldom notice the enormous changes that the Napoleonic Wars caused to the Western Hemisphere...things far larger and with much greater effects than our own War of 1812. The Louisiana Purchase really started it, as Napoleon sold Jefferson a large block of land that really "belonged" to Spain. In shifting their forces to try and limit American expansion, the Spanish-loyal authorities opened the door to losing the remainder of two continents. 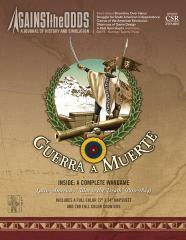 Guerra a Muerte depicts the 14 year struggle that saw Spain's possessions in the hemisphere change from "almost everything not U.S." to "Cuba and Hispanola." As in the American Revolution, the local population could be divided into "patriots/revolutionaries" on one side, "loyalists/Royalists" on the other, and a huge middle block of those who wished to stay out of battle-- over which both sides exerted tremendous pressure, making these episodes as bitter as any period in history. The game title means, "War to the Death," and comes from a proclamation Simon Bolivar made to all Spaniards in Venezuela-- "support us or else." Warfare took place from the remote northern border with America to the tip of the continent now shared by Chile and Argentina. Progress ebbed and flowed, with territories changing hands several times and the intensity and size of battles slowly escalating. The overall war is a fascinating struggle of varied elements, from Spanish and "Royalist" troops to formed patriot units, militias, armed mobs, Indians, and mercenaries. Actions include slave revolts, naval assaults, guerilla war, battles with a hostile environment, and the interplay of politics with economics...all depicted and intermeshed to affect overall play as they affected real events. The game offers a map from "New Spain" to "Rio de la Plata," with area movement, one-year turns, and 280 half-inch counters. Guerra a Muerte offers a chance to understand a hardly-heard-of period of Western history, the effects of which are still with us today.